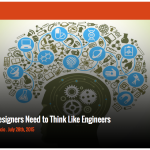 Designer’s Need to Think like Engineers? Here and there again, many artists or designers have problems with their creativity and put themselves in a slump. This happens to writers, business men, entrepreneurs…well everyone at some point. So what do we do in order to take ourselves out of this slump we are in? How can we get back on our hot streak and hit a home run once again? The answer is simple really; Think Differently. We all have two sides of the brain we can use, some use one side more so than the other side. For a designer, creativity is inspiration that we find from all sorts of things. But what happens when we start to think like an engineer? Using the other part of our brain can help us advance as designers. Here is an article that talks about designers using their brain like an engineer that is quite interesting. Check it out!